From bullfrogs to dried shrimp, the humble mooncake is getting a taste makeover — but it's not to everyone's liking. Mooncakes stuffed with shrimp and cheese, bullfrog with pickled cabbage, and abalone are the latest offering to lure young eaters. At the Sunya Cantonese Restaurant on Nanjing Road E. yesterday, David Chen, 28, had queued for over 30 minutes. His target was simple: a shrimp and cheese mooncake. As a loyal customer of new-taste mooncakes, Chen queued more than an hour last year to buy yanduxian mooncakes at the same food store. Yanduxian, a typical Shanghai soup with bamboo shoots, salted and fresh pork, was made into the filling of mooncakes by Sunya last year, which was a hit and is available again this year. “I like traditional food like mooncakes, but I don’t want to always eat the same tastes such as pork and bean paste,” said Chen, who works near the outlet. “These special tastes are worth a try,” Chen said, before rushing to the Shanghai First Food Store opposite Sunya to try another mooncake, bullfrog with pickled cabbage. Long queues were formed outside Sunya yesterday morning. Huang Haigen, deputy general manager of Sunya, said shrimp and cheese mooncakes hit the shelves in late June. Demand soon exceeded supply. Because the mooncakes are hand-made, the store set a limit on purchases. Each shrimp and cheese mooncake is priced at 10 yuan (US$1.50). “Our production cannot catch the demand,” Huang said, adding the store makes more than 10,000 shrimp and cheese mooncakes daily — and it still sells out. It has delayed closing time by half an hour to 6pm because of the demand. In peak hours, people have to wait up to two hours. Huang said the food store introduced the shrimp and cheese mooncake last year after market research. He said mooncake must win support of more than 75 percent of eaters in testing before it can hit the market. Huang said shrimp and cheese mooncakes are much more complicated to make than pork, due to filling the cheese in. Opposite Sunya, at the Shanghai First Food Store, another famous time-honored food store, many young people queue outside to buy its bullfrog mooncake. “I am a big fan of bullfrog, and it is difficult for me to resist this temptation,” said Huang Xiaoli, a student passing by, adding that the mooncake is delicious. 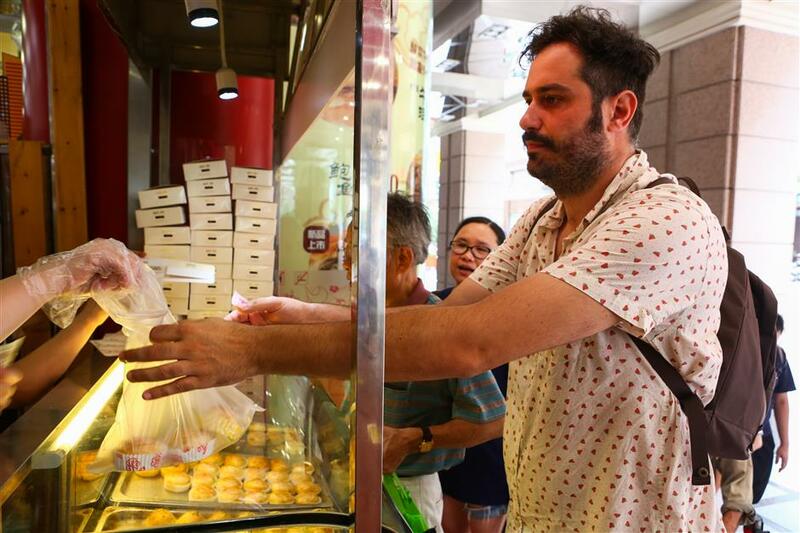 Italian Paolo Pizzo buys mooncakes at the Shanghai First Food Store yesterday. The mooncake even attracted foreigners. Paolo Pizzo, an Italian tourist, said he queued out of curiosity. “I don’t know what they are looking for, so it made me queue just to have a try,” he said. “It is the first time for me to eat mooncakes. I prefer the traditional taste and meat is better,” said Pizzo, who bought three mooncakes filled with pork. Lu Lu, deputy general manager of the Nanjing Road E. branch of the store, said bullfrog mooncakes are more popular among young people. “The idea of bullfrog mooncakes originated from bullfrog noodles and crayfish shengjian (pan-fried dumplings), which are very popular,” he said. The store sells more than 2,000 bullfrog mooncakes a day. “Traditional food stores need to keep developing innovative foods to attract different age groups,” said Lu. But not everybody is happy about new taste, especially older citizens. “I don’t like bullfrog mooncakes because bullfrogs have many parasites. I don’t dare,” said Pan Longfa, a retiree. He prefers pork, carrot and dried shrimp. “Traditional taste survives the change of times and is always classic.